Not everyone likes green technology. This is especially true when the people's view and welfare are not thoroughly examined and considered. I am not implying that what happened in Mexico is a case of local inhabitants being sidelined, but from the following piece of news by AP, the locals seem like being let down by big companies investing in wind energy. This reminds me of the big conglomerates opening up vast area of land in Sabah to plant palm oil at the expense of the small holders (local population). If you read this article, you will find that big portion of the frustration is due to lack of participation of the local community. By comparison, global installed capacity is estimated at 244 GW, with China as one of the biggest investors. The country is posting one of the world's highest growth rates in wind energy, and almost all of it is concentrated in the narrow waist of Mexico known as the Isthmus of Tehuantepec, where winds from the Pacific meet winds from the Gulf of Mexico, spawning places so wind-blown that one town's formal name is simply "Windy." President Felipe Calderon has made the inauguration of wind parks one of the main focuses of his administration's ambitious pledge to cut Mexico's carbon emissions by 30 percent by 2020, and on Tuesday — as he has done before — he stopped by the state of Oaxaca to inaugurate a new clutch of wind turbines, praising the extra income they provide for some farmers. "Yes, you can fight poverty and protect the environment at the same time. This is a clear example," Calderon said at the opening ceremony. But as in the past, he did so under tight security, as local protesters threatened to mar the inauguration. The president's office normally publishes a detailed schedule of his planned activities, but didn't do so with Tuesday's inauguration, keeping it under wraps until the event took place. So far in 2012, Mexico has posted a startling 119 percent increase in installed wind-power capacity, more than doubling the 519 megawatts it had last year, the highest annual growth rate listed in the magazine Wind Power Monthly's "Windicator" index. Mexico had only 6 megawatts when Calderon took office in 2006. While Mexico, with a total of around 1.3 gigawatts of wind power, is still a tiny part of the world's estimated 244 gigawatt capacity, it offers an insight into what happens when the industry focuses overwhelmingly on large farms dominated by large companies that are concentrated in a small, desirable area. It has been mainly Spanish firms like Iberdrola, Union Fenosa and Gamesa, and U.S. firms like Sempra Energy, that have built the huge wind towers that now crowd the Isthmus of Tehuantepec, leaving the local population feeling invaded. 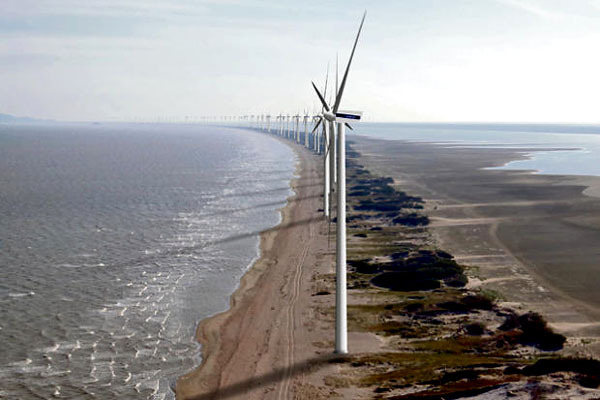 Only 4 of Mexico's 17 wind farms are located outside the isthmus. "We are asking these multinationals to please get out of these places," said Irma Ordonez, an activist from the Zapotec Indian town of Ixtepec, Oaxaca. "They want to steal our land, and not pay us what they should." "When they come in they promise and promise things, that they're going to give us jobs, to our farmers and our towns, but they don't give us anything," said Ordonez, who traveled to Mexico City in October to protest outside the offices of a Mitsubishi Corp.
A source close to the project, who was not authorized to speak on the record, said the project had been approved by village assemblies, would have little impact on fishing activities in the lagoon and would contribute an amount equal to about half the township's annual budget in coming years in compensation and royalties. I havent been to any wind farm, so, I can't comment. But I've read a lot about noise coming from the blades and rotors. Not sure if the claims are unfounded.